Blues boss Jose Mourinho refused to discuss the decision after the match. Chelsea's appeal will be heard by the Football Association on Tuesday. If it fails, Courtois' expected one-match ban would see him miss the trip to last season's runners-up Manchester City on Sunday. 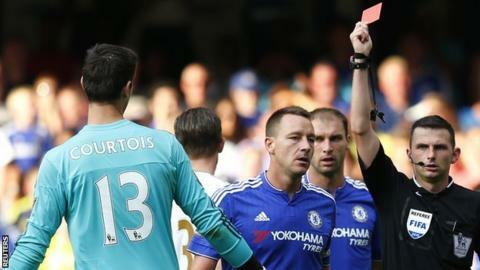 Asmir Begovic, a summer signing from Stoke, made his Blues debut as Courtois' replacement against the Swans.